Image: Map of possible canal route. Source: The Telegraph. The proposed waterway would lead ships into Lago de Nicaragua, the nation’s largest fresh water source, and require approximately 120 miles of excavation through sparsely populated jungles in the Nicaragua’s southeastern region, as well as, excavation on the Pacific Coast. 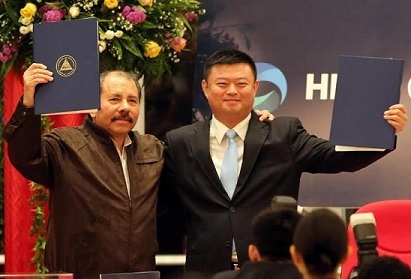 Wang’s Hong Kong-based company, HK Nicaragua Canal Development Investment Co., also known as HKND Group, obtained the right to dig and operate the canal for 50 years, with the possibility to renew the contract for another 50 years in the future. The Supreme Court in Managua has also approved the project, ruling a Chinese-operated waterway does not infringe on the nation’s constitution. 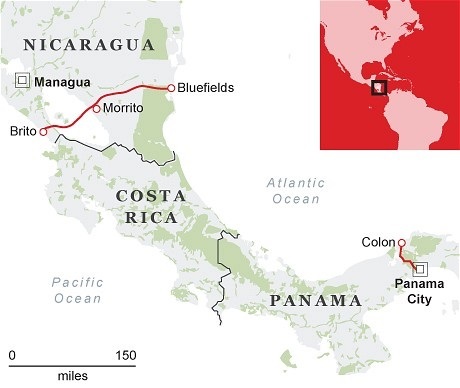 If completed, Nicaragua would create a 170-mile passage between the Pacific and Atlantic oceans to compete with the century-old Panama Canal – where construction crews are currently building a new lane of traffic to double capacity, but the expansion has faced repeated delays. Along with the canal, Wang plans to build an oil pipeline, an overland route for vehicles, two deepwater ports, two airports and establish duty-free zones in Nicaragua. HKDN Group representatives said revenue from interoceanic traffic could lift Nicaragua out of poverty. The nation has long been listed as the second poorest economy in the western hemisphere after Haiti. “Nicaragua will become by far the richest country in Central America – and that will affect the entire region,” the La Paz newspaper, Pagina Siete, quoted HKDN spokesman and former La Paz mayor Ronald MacLean Abaroa as saying in 2013. “Investment in this project is three to four times the GDP of Nicaragua, there will be an effect of full employment and prosperity,” he continued. While the canal would have a significant impact on local and global economies, many details remain unclear, including a finalized canal route. Manuel Coronel Kautz, chief of Nicaragua’s Canal Authority, has also said work for the Nicaraguan canal would not begin until 2015. Regardless, project feasibility studies are under way and HKDN representatives said the waterway would be operational by December 2019. According to MacLean Abaroa, the canal will be built as fast as possible to accommodate growing international demand for interoceanic waterways that can handle larger vessels. “The transfer of bulk commodities between the Americas and Asia demands enormous ships, such as ore carriers and supertankers that simply cannot pass through the Panama Canal,” MacLean Abaroa said in a video interview on the HKDN Group website. “The Nicaragua Canal has the potential to open up new cost-efficient routes for the shipment of commodities, especially crude oil, [liquefied natural gas], steel from the United States to Asia and iron ore from Brazil to Asia,” he added. Critics of the canal have said HKDN Group lacks credentials and does not have the necessary experience to undertake a complex project of such magnitude. On a wider perspective, the Nicaraguan Canal is one of several projects under Wang’s umbrella company, Beijing Interoceanic Canal Investment Management Co., through which he is also building a $10-billion deepwater port in Ukraine. A somewhat reclusive tycoon with global ambitions, not much is known about Wang’s personal life other than he made his fortune as the chairman of the Chinese mobile phone technology provider Beijing Xinwei Telecom Technology Co. 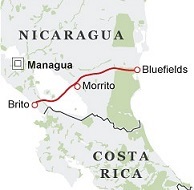 The idea for a Nicaraguan Canal has a long history of foreign intervention and also prevention. In 1897, the United States Nicaraguan Canal Commission proposed a waterway through Lago de Nicaragua, but abandoned the plan when it took over the problem-ridden French excavation of the Panama Canal in 1904. Image: Nicaraguan President Daniel Ortega (L) and Wang Jing, president of HK Nicaragua Canal Development Investment Company. Picture taken in Managua on June 14, 2013. Source: AFP Inti Ocon. US troops later occupied Nicaragua between 1912 and 1933 to deter other nations from building a Nicaraguan canal, which would pose as competition for the US-owned Panama Canal. This period gave rise to Augusto César Sandino, Nicaragua’s anti-imperialist icon and inspiration for the Sandinista National Liberation Front (FSLN), the revolutionary force that overthrew former dictator Anastasio Somoza DeBayle in 1979 and currently serves as the incumbent political party under President Ortega. Since the 1930s, prospects for a Nicaraguan Canal were largely abandoned as opponents also cited the risk posed by high volcanic activity in the region along with the environmental impact of linking ocean waters through Nicaragua’s largest freshwater lake. In recent years, environmentalist have said the project could threaten drinking water supplies and an ecosystem of 300 small islands in Lago de Nicaragua that serves as a breeding ground for the American crocodile. Nicaragua’s nascent tourism industry may also suffer as ocean liners begin to surround Isla de Ometepe, a rare jungle island formed by twin volcanoes that has become one of the nation’s top attractions. In response, Wang told The Telegraph protecting the regional environment was a top priority for HKND Group. “I take all responsibility for any environmental damage. I have told my employees that if we make a mistake on this front, we will be dishonored in the history textbooks of Nicaragua,” he said, acknowledging the nation’s rough past with foreign intervention.